Rat Island author Will Stolzenburg writes about restoring Palmyra, Island Conservation, and the battle to save island species. With the summer 2011 fieldwork completed and the crews moving on, there is reason to be hopeful that Palmyra Atoll has just become the latest world-class wildlife sanctuary made safe from dangerous invaders. If all goes well—if the bait that was laid several weeks ago has found its mark, if the check-ups to come find no signs of surviving rats—the champions of Palmyra will have taken a giant stride toward restoring the island to a wilder, more glorious version of itself. The seabird colonies of Palmyra will be free again to amass in numbers unseen since the predatory rats made land there during World War II. Not to mention the extraordinary fleet of land crabs (one monstrous species of which measures three feet long), or the towering Pisonia forest (the redwoods of Oceania) that had been subjugated to Palmyra’s reign of the rat. Over the past two years I’ve been watching and writing about this conservation campaign as a fascinated spectator—not only of Palmyra’s resurrection, but of many islands the world over that Island Conservation and their collaborators have targeted. I’ve followed the island campaign as perhaps the most uplifting story in conservation of my twenty years as a journalist. Lately I’ve publicly proclaimed it the world’s greatest wildlife rescue. And now rather suddenly I have magazine reporters and radio hosts and acquaintances at the local bar asking me to explain myself. The fact that you’re visiting this website suggests you don’t need to be told what I’ve been telling them. Over the past three thousand years, our ever-ubiquitous species has deposited a menagerie of mainland predators and competitors on thousands of islands far removed in space and time from their evolutionary origins. On these islands, thousands of species of birds, reptiles, and small mammals, and untold millions of lives, have been lost in the ensuing lopsided clash of savvy mainland predators versus naive, defenseless island species. And over the last century, most ardently and effectively in the past twenty years, conservationists have begun rescuing the remaining islanders and restoring their sanctuaries, by systematically removing the invaders. That’s the elevator speech I use to explain my recent island obsession. How many other conservation campaigns can you name that have the tangible potential to save a million birds at a swipe, whose geographic breadth encompasses nearly half of all threatened species on the world’s Red List, whose success rate is running above ninety percent? For that matter, how many conservation stories in these times even offer a happy ending? I don’t skim blithely over the downside of this campaign, over the pain and suffering that almost invariably goes with this brand of conservation by eradication. (And I have a hard time understanding those who do.) But neither do I overlook the far greater pain and eternal loss that faces so many native islanders who are otherwise left to fend for themselves. On balance, this story brings a refreshing departure from the many depressing tales of my environmental beat. This campaign isn’t about backpedaling, and taking comfort at losing only a little ground. It’s about pushing back and reclaiming our natural heritage, manifest in the magnificent swaths of island wilderness ringing anew with the multitudes of a purer past. As to why more of us in the media aren’t shouting this story from the rooftops, is a question whose answer still eludes me. You can learn more about Will Stolzenburg at his website, http://www.williamstolzenburg.com/. 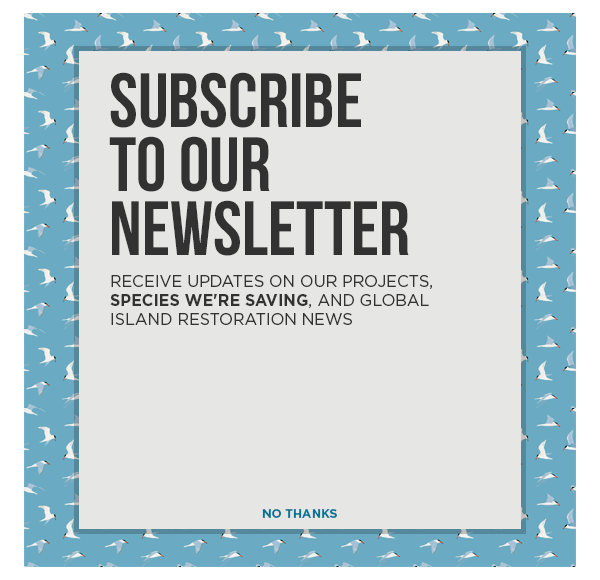 To read the latest updates on the Palmyra Atoll Restoration Project click here or visit www.protectpalmyra.org.